How can I live up to the wonderful response to my aurora shot - I cannot. Thank you for your wonderful comments. As a result I am now shopping for a decent negative scanner and I will start digitising all my old film shots, unfortunately I did a lot in APS before I got a 35mm SLR and APS scanners are rarer than hens teeth, so looks like I'll be paying a small fortune to get them scanned commercially. I was on a diplomatic posting at the Australian Embassy in Belgrade from 2001 to 2003. It was the Federal Republic of Yugoslavia when I arrived and under UN sanctions. Several months later I was there to see Milosevic off to the Hague for war crimes trials. The country later in my time there changed its name to Te State Union of Serbia and Montenegro, and shortly before my posting ended the Prime Minister Zoran Djindjic was assassinated, by members of organised crime groups that he was trying to clean up. When I first arrived in Belgrade it was like the start of the Wizard Of Oz, everything was in black and white and it seemed like a grim and forbidding place. I wanted to share my experiences with my family who were travelling vicariously through me. This was my first time living overseas, my first time in Europe, the first time I had been anywhere other than Indonesia. When I arrived I had a basic 35mm compact camera, no zoom, no dials or adjustments, just point and click. I then purchased a nice little Nikon APS film camera, I loved it had a zoom and the choice of shots (panorama, standard etc) that APS offered. Then for my trip to Canada I bought my first SLR and less than 6 months later an upgrade to the SLR. Then after being called a luddite I decided to investigate digital. In December 2003 I purchased my first digital camera a Canon IXUS V3 - it was a terrific camera. 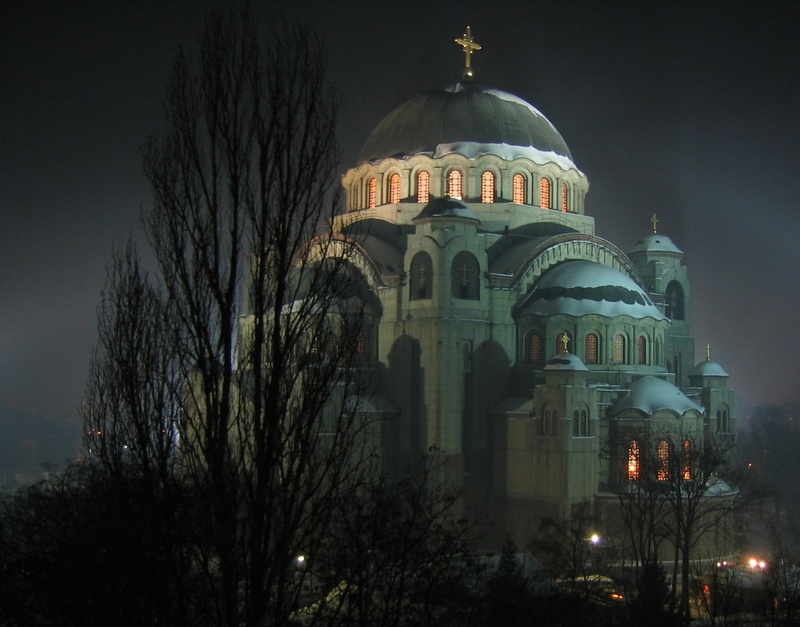 On Serbian Orthodox New Years Eve I was invited to a colleague's apartment for Russian Caviar and Vodka and a view of the cathedral. I went with SLR and digital p&s and tripod and was thrilled with the shots I got. Unfortunately by midnight and fireworks was not so inclined to stand on their sub-freezing balcony for further shots. Since the time I took this shot I understand the Cathedral has been clad in marble. Including the golden cross it is 82m tall, 91m long and 81m wide, in the form of a greek cross. The church is on the site where St Sava was burnt and was first planned as early as 1895. Construction of this church commenced in 1985. Earlier churches stood on the same site with ultimate plans of a fine building to be built, however, this was interrupted by wars and other events. With photography and looking for the beauty here, like the wizard of oz my vision of the place transformed from a stark and miserable place to a beautiful city with amazing history and architecture and very kind people. well i think you have well and truly lived up to your aurora shot with this!! I t looks like something off a movie set, beautiful yet a bit eerie!!! love it...fave!! What a fairytale photo! Great commentary, this is going to be a wonderful project to continue to follow! @bobfoto thanks - your idea and encouragement led to it. This does have a movie set feel to it. I think it's the lighting, both within and upon the cathedral that gives a surreal model-like quality. Fascinating background story. Perhaps an older Nikon cools an could be found with an APS strip holder. I'll keep that in mind when perusing scanner listings for myself. Beautiful long exposure. There is a lot of depth to the scene. Great shot. This is just spectacular. The sharpness, the lighting, the mood and the color. You certainly have been around the world a bit, haven't you Thank you for sharing your comments. Gosh that has an ethereal beauty almost like a master painting.... what a beautiful photo! The light and mist and soft colour is just amazing. I remember those events unfolding... photos do preserve memories, thank you for sharing them. (Fav of course) :)! Amazing magical shot. Love it. It looks mysterious. I like the fairytale quality! love the shoit & words! really beautiful - the light is awesome! This is a awesome shot. This building is beautiful. This is amazing!!! I love the ambience! like a fantasy shot, wow! perfect night shot! as for your scans, sometimes libraries have scanners that the public can use on site. might be worth checking out before you buy. Beautiful shot! Has a mysterious atmosphere to it, and lovely lighting. Sounds like you would have seen some interesting changes in your time there. looks like a fairytale! beautifully captured! Amazing shot - love the mood and the lighting! beautiful shot and what an interesting career/life. NATO bombed Belgrade not long before that I think, when the Serbs were still in Kosovo. I wouldn't have imagined English voices would have recieved warm welcome after that. This photo is beautiful, and an interesting story. I've seen some very good stuff about the wars in the region and it always does look very grey and stark as a landscape. The architecture of a fairytale. This shot is amazing! I love the eeriness. This makes me think of Harry Potter for some reason... the light? the dark? And I'm not a HP fan! It's gorgeous. Stunning night shot, great view and what an interesting time you must have had living there through such changes.